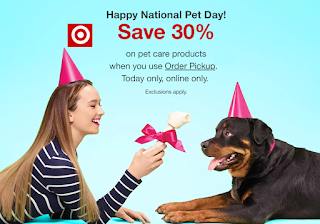 30% off Pet Food, Treats, Toys, Cat Litter & More + Free Pickup at Target. Lots of awesome deals especially on litter which is rarely on sale. Stock up!! DISCOUNT AUTOMATICALLY SHOWS AT CHECKOUT, just add to cart and go to checkout to see lower price, no code. MUST DO STORE PICKUP TO SEE THE DISCOUNT!